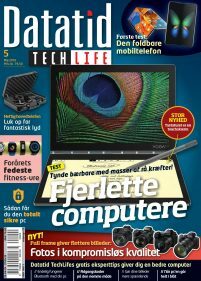 With the monthly magazine “Datatid TechLife”, our readers are able to get the most out of their digital equipment such as computers, smartphones, tablets and digital cameras. The magazine is packed with easy-to-read expert tips and ideas related to those products. Every single number of Datatid TechLife also contains a wide range of comprehensive hardware and software tests. The magazine gives the best information about the latest gadgets, smart TVs, digital music systems plus news about computers and other electronic equipment. In this way our readers are able to discover what is “hot and not” on the market. The readers of Datatid TechLife are not IT-experts. However, they still know more about technology than most people. They are our “Tech Ambassadors”, meaning that they are the ones that their circle of friends asks for advice when they buy new tech equipment. With their knowledge from Datatid TechLife, our readers are able to tell their friends and family what to buy and what not to buy and to guide them in the best way. This means that Datatid TechLife not only benefits our readers but also everyone they know. Now in its thirty-first volume, Datatid TechLife has always been an internationally oriented IT, AV and gadget magazine, giving extensive coverage to foreign products, shows and trends. Through EISA, we come even closer to the industry, gain international credibility, and receive valuable inspiration as well as feedback from friendly colleagues, all of which enable us to service our readers and advertisers better. Brother VC-500W giver uendelig mange muligheder for at printe både grafik og fotos. Den udskriver labels i farver, uden brug af blæk, og kommer med brugervenlig redigeringssoftware til pc og mobiltelefon Indlægget Brother VC-500W [TEST]: Print labels i farver fra computer og smartphone blev først udgivet på Alt om DATA, Datatid TechLife. Droner kan og bruges efterhånden til så meget, at de placerer sig højt og hævet over andre mere jordbundne teknologier. Men det er ikke kun fordele og gode gaver, der kommer ned til os deroppe fra deres luftlag Indlægget Dronen på tronen blev først udgivet på Alt om DATA, Datatid TechLife. Vi har fundet det bedste internettet har at byde på, når det gælder gratis software til din computer og smartphone Indlægget 4 gode gratis programmer blev først udgivet på Alt om DATA, Datatid TechLife.